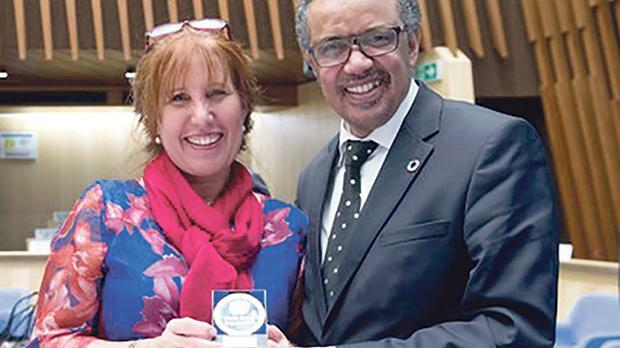 Lucianne Licari, a Maltese doctor working in the Cabinet of the World Health Organisation’s Regional Director for Europe, based in Copenhagen, and a member of the executive management of the WHO Regional Office for Europe, has been awarded two WHO Rewards for Excellence. This prestigious annual reward celebrates excellence among the WHO staff members and was originally launched by the previous director-general, Dr Margaret Chan, on November 30, 2015. 3. The Deputy Director-General’s Reward, offered to individual staff members or teams who have made exceptional contributions to the headquarters. Dr Licari was nominated for, and won, the DG Reward for Excellence 2016 for the work that WHO Europe Communications team delivered under her leadership and management, as well as the RD Reward for Excellence 2016 for her personal role and contribution to the work of the organisation. WHO Director General Tedros Adhanom and Zsuzsanna Jakab, Regional Director of the WHO Regional Office for Europe, presented their awards to Dr Licari on November 2. Dr Licari is a medical doctor and EU-accredited public health specialist. From 1991 to 2002, she held increasingly senior positions within the Ministry of Health in Malta, including in the departments of health information, disease surveillance, public health, as well as in health policy and planning. During this time, Dr Licari was also a senior adviser on environment and health issues to the minister of health, and also to the ministers of environment, tourism and foreign affairs. She also held positions on various national boards and committees, including chairwoman of the Clean Air Board, member of the board of the Malta Environment and Planning Authority (Mepa) and member of the Consultant and Advisory Board on Environment chaired by the deputy prime minister. Dr Licari also held positions on other national committees, such as the Tourism Environment and Health Intersectoral Committee, and the National Advisory Committee on Sustainable Development. Dr Licari joined the WHO Regional Office for Europe in Copenhagen in January 2003 as Regional Adviser for Environment and Health co-ordination and partnership. In 2009, she moved to the European Centre for Disease Prevention and Control (ECDC) in Stockholm, where she joined the ECDC Director’s Cabinet as senior expert in country relations and co-ordination, before returning to the WHO Regional Office for Europe to take up her current position as executive manager for Country Relations and Corporate Communication, on the cabinet of the Regional Director in late 2010. Dr Licari is also special representative of the Regional Director to the South Eastern Europe Health Network.